NAMIWalks’ public, active display of support for people affected by mental health conditions is one important way we are changing how Americans view people with a mental illness. NAMIWalks brings together individuals and businesses to help raise funds, combat stigma and promote awareness. Located in Sioux Falls, South Dakota, NAMI South Dakota raises awareness and provides essential education, advocacy and support group programs at no cost for people living with mental illness and their loved ones right here in our community. NAMI South Dakota is a nonprofit, grassroots organization that addresses the mental health needs of our community, replaces stigma with understanding and helps thousands of families and individuals each year. NAMI South Dakota is a 501 (C)(3) mental health organization. 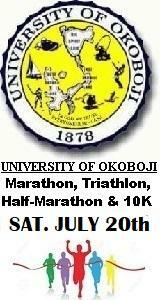 This 5K run is in conjunction with the annual NAMI Walks South Dakota. Prizes will be given based on age and gender.